This page lists other documentation in regards to Brilliant Pagoda or Haze Castle. Changing stages, changing bosses as well as danmaku everytime you play! In addition, special events that happen randomly! While facing the surge of overwhelming uncertainties, you the player must decide your destination. Thanks to the【Path Selection System】there are stage branches and multiple endings. In order to face the pandemonium, I implemented the HP and Barrier durability system! as long as you stack up multiple plays then even a bullet hell newbie can overcome the hardest of danmaku! First-time players will absolutely die! Full on absurdity! With strengthened characters and lady luck's favour, overcome the brutal danmaku! I give you, a random impromptu bullet hell STG with way too many alien elements for a danmaku STG! "Len'en Ten'eisenki ~ Brilliant Pagoda or Haze Castle"
You don't need to play the past games, but if you have you'll have more fun! ・ver1.10a Bug fixes and minor adjustments; Record danmaku challenge attempts, etc. *Clearing this mode will not unlock anything. Why don't you try reaching for the top? The game-board has been given new graphics. The sub-event image captions have changed from vertical to horizontal. There are now diagonal lines in the cell map to tell the player what cells they can still cross to, which previously there wasn't. Mitsumo and Souko Shirami were originally first stage haze and brilliant bosses respectively, but their routes have swapped in the final version. Suzumi Kuzu originally appeared as a hidden stage 3 boss, but has moved to becoming a hidden final boss. Due to point above, the dialogue with the Shrine and New Emperor Team was drastically changed. The prologue was also given a thorough short-story. Aoji Shitodo's and Sese Kitsugai's upgrades are unlocked automatically, due to them being playable characters. 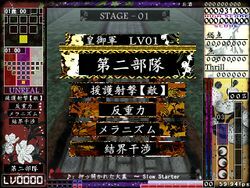 Midbosses could appear on stages where they appear as bosses, for example Aoji Shitodo could be a midboss on Stage 2. This was changed in the full version. Six additional sub-events were added to the full version. Shot power decreases even on non-fatal hits, whereas shot power was only lost on death in the trial. All spell cards now begin with several seconds of invulnerability at the beginning to prevent more powerful characters from defeating the spell card in a matter of seconds. Danmaku capture history is now implemented; the game now remembers the number of attempts made on a single spell card, as well as the number of successful captures. The amount of achievements were added to the title screen and changed over different versions. The menu system on the title screen has been changed to have a box behind each option. Final boss Suzumi was given new facial expression portraits. Various tweaks to player skill upgrades. Various graphics adjusted places and re-worked on the gameplay screen. Some background were re-worked on. Dialogue had very trivial changes that needed fixing. Apart from the fifth team being implemented, there were also some significant changes to the game between the full version (v1.10) and v1.20. 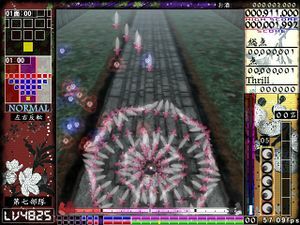 Some danmaku patterns have been re-worked for better balancing, such as Kaisen Azuma's Leaping Medicine "Tsukuba Toad Oil", Jun Amanomiya's first non-spell and Kaoru Kashiwagi's second non-spell. Xeno a for example has had their dice changed in the way that, when landing on 3, it no longer turns around and follows the player. A snowy-like particle effect was added to the "idiots now thinking" loading image. This came from JynX's Fools Rush In . Aoji, Hooaka, Fumikado, Iyozane, Jun, Kaoru, Kujiru, Kurohebi, Saragimaru, Shion and Sukune portraits were given extra facial expression images. Suzumi especially has the biggest amount of new portraits given, due to being playable. Due to new upgrades, the maximum level of upgrades has moved from 5225 to 5375. When picking a character, you get a little red "upgrade" button on the botton-left corner, that gives quick access to turning on or off the upgrades. Achievements were fully worked on and were given a separate menu. Screenshot of Suzumi's hidden shot-type in v1.01a. On 23 March 2017 with v1.01a, YouTuber Two Eyed Mike discovered a supportively unused shot-type covered in the unknown secret team. This data existed in the three slots with the three unselectable "?" characters on the character select screen, and are all identical. Due to the mechanics of the shot-type, it was largely speculated to be Suzumi Kuzu amongst the fanbase, later revealed to be true in v1.20a. One can access and play with this shot-type by hacking the game with Cheat Engine. This will scan for the value of the currently highlighted character (highest being the decimal 11 or hex 0B, which is Aoji Shitodo), and after, the player can change this value to the decimal 12, 13 or 14 (in hex 0C, 0D, or 0E respectively). Afterwards, the player can play as what appeared to be an unused playable version of Suzumi. The shot-type highly resembles that of Suzumi's official shot-type of v1.20a onwards (See Gameplay § Characters). The main difference is that their bomb covers the screen with static. The player character has no sprites and can only be seen by focusing to make the hitbox visible. Since there isn't any valid dialogue files associated with the secret team, getting hit or starting a boss fight will cause error messages to appear in the top left corner, and music transitions will not occur when fighting bosses. Copying some existing dialogue and renaming them (e.g. talk_Humikado_Aoji_0.txt to talk__Aoji_0.txt) will fix some of the error messages. There are four "defeated" portraits of Suzumi unused in the data folders. These were originally used in the demo version, as there were dialogue after their defeat on stage 3:0. Since Suzumi was moved to being a final boss in the final game on stage 6:0, the portraits had no use. There are two sub-event graphics found in the cell_eff folder that were left after being used for testing the display of midboss names and titles, name boss_name_Test.png and boss_sub_Test.png. They translate to "Test" (テスト, tesuto) and "Experimental Boss" (実験用ボス, jikken-yō) respectively. A sprite sheet for a test character exists under the name test_dot.png, which is a duplicate of Mitsumo's sprite sheet. There is an early version of the dialogue between the Scoundrel Team against the final boss Suzumi, called talk_Kuroji_Suzumi_0.txt. This was deleted in v1.20a. This is a list of known glitches, bugs or other unusual capabilities that aren't supposed to be part of the original gameplay. Before the full release, there was a major bug within the game that prevented the game to be released. Sometimes, text within the pause menu won't appear. Occasionally, the relevant theme will fail to play when facing a stage's endboss, resulting in that stage's theme continuing to play throughout the boss fight. This may also involve the character's portraits not appearing during conversation, along with the text not properly in-lined, especially when playing as the Preschool or Scoundrel team. When facing Yabusame as a midboss, a portion of the stage will remain inverted after they are defeated. The line "自機の種類が異常です" would sometimes appear on the top left corner of the game screen for unknown reasons. This was fixed in later versions. Originally working in the Demo version, the tutorial would crash when opened in the full version. This especially happens when playing on Wine. This was later fixed in version v1.20. 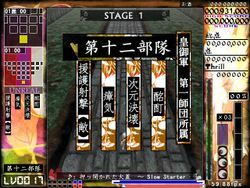 When the player has a Tsurubami upgrade, unless it is full, the percentage of damage that should only be applied to killing immortal enemies applies to ALL enemies instead, thus no enemies can be properly shot down. This may also apply to midbosses and bosses. Sometimes, alcohol would either stay stuck at 0 for an entire run or increase to 999,999,999 very quickly. This was fixed in v1.20e. The 30th achievement "get all other achievements" would not appear even if the player completed all other 29 achivements. This was fixed in v1.20f. If the player's score ends up being a negative number, the amount of alcohol may max out to 999,999,999 gallons. This page was last edited on 29 September 2018, at 20:33.